In the far-flung alleys of Facebook, Ex-pat Joseph (Wiggy) Wiegner has incited warfare against aging, but still very much alive Ryan (Witty) Witters. Not to be confused with Witty's ongoing war with New England's favorite harrier, Nate Jenkins. Earlier today, Wiggy pushed a meaningful message concerning his educational institution, THE Lock Haven University track and field team. #SaveHaven. Witty, alumnus of the University of Evansville Purple Aces which recently announced the return of a track and field team, immediately jumped at the chance to discern himself from the namesake he has so often been confused with. He arguably bit off more than he...argued for. Wiggy never one to stand down, stood his ground and chirped back, which prompted Witty to drop the ultimate "actions speak louder" not 1, not 2, not 3...counting his consecutive FD8k crowns (4 more than the vaunted Wiggy). Get your cupcakes ready. This is going to be lit af. Sean Barrett, Kieren O'Connor, Kerry Allen, Emily Potter, and Brian Young were all featured in the Washingtonian on how they maintain busy lives and keep up with Marathon training at the same time. It was a banner day at the Terrapin Invitational, with many fine performances. Among the highlights was the women's DMR getting the win in 12:22.9. Alyson led off in 3:47.7 for 1200, followed by Kerry in 67.4 for 400, Jesse in 2:18.0 for 800, and Steph in 5:09.7 for 1600. The time was not particularly fast for several reasons, including that it was the first race of the season, and we weren't expecting miracles; there was no competition, at all (we lapped the field); we were shorthanded due to the march, forcing Kerry to volunteer for the 400 (and she ran a heck of a good leg, but she's a marathoner); and Steph was doubling back from the 5000 with only about 30 minutes rest. More important than the time was the fact that we were out there at all. This was the first competitive relay in GRC history, but it won't be the last, as we are building an extremely strong women's middle distance squad, and we will see many more great performances from them in the weeks and months to come. We've already got an extremely strong women's distance crew, and it showed in the 5000. Frances got the win by the slimmest of margins over a fast-closing Maura Linde, in 17:11.26 and 17:11.28, respectively, followed by Elena in 17:14.8, Steph in 17:20, and Kerry in 18:16. 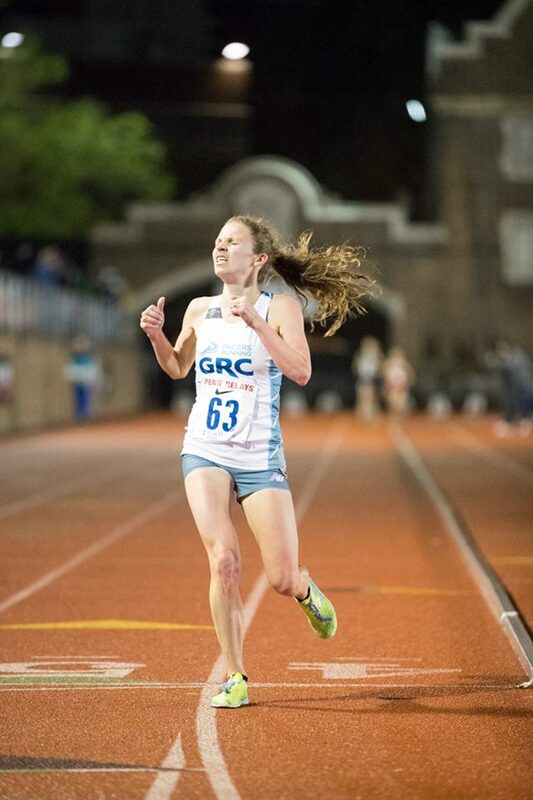 It was an outstanding GRC debut for Maura, a 2016 Syracuse grad who will be a major addition to our track group. Elena was within 2 seconds of her PR despite only working out once since Clubs, and we will see a parade of PRs from her in the weeks to come. Steph led most of the race before backing off to save a little strength for the DMR, and Kerry got in a very solid early season effort. On the men's side, Stewart got the win 15:00.1, in a very controlled effort. After pacing the 5000 for about 2400 meters, Elyssa came back in the mile in 5:17.09, which puts her 5th on the GRC all-time list. In the 3000, Liz ran 10:30, and Michael was second in 8:47 after leading most of the race. The team gathered last night for our annual meeting and team awards. See below for commentary on each recipient. Thanks for all of your support in 2016! Steph established herself as a national-class runner in 2016, recording numerous impressive victories, and running a seemingly endless string of huge PRs. Among the notable races Steph won were the Penn Relays Olympic Development 10,000 meters, the Army 10 Mile (by over two minutes), and the USATF East Region Cross Country championship. On the track, Steph ran PRs of 4:31.1 for 1500, 9:49 for 3000, 16:32 for 5000, and 34:12 for 10,000, and each of those performances is second on the GRC all-time list. On the roads, Steph ran PRs of 4:56 for the mile, 16:42 for 5k, 56:29 for 10 miles, and 1:15:45 for the half marathon (on a hilly course, with no race-specific workouts, 36 hours after running a hard 1500 on the track). Her 5k and 10 mile times are club records, her mile time is second on the all-time list, and her half marathon is third on the all-time list. Steph capped off her year with a stellar performance at Clubs XC, where she placed 26th, the second best result in GRC history, and she led the team to a superb 6th place finish. Steph is only getting better, and we’re going to see many more impressive victories and club records from her in the months and years to come. Stewart started 2016 looking to establish himself as a GRC A-team runner. After a series of breakthrough performances at wide range of distances, Stewart finished 2016 as a threat to break numerous GRC club records in 2017. On the track, Stewart ran PRs of 3:57.2 for 1500, and 14:39.5 for 5000. On the roads, he ran PRs of 4:13.9 in the mile, 14:45 for 5k, 31:40 for 10k (less than an hour after running his road 5k PR), and 51:15 in his 10 mile debut. 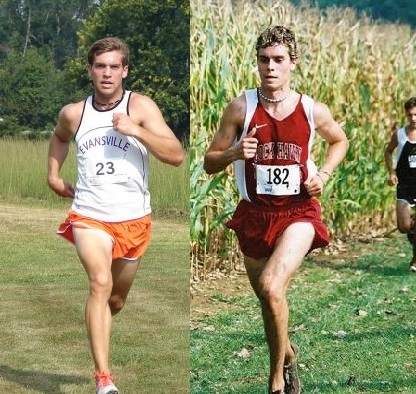 Stewart’s performance at Clubs, where he ran a 10k PR of 31:15, is emblematic of his amazing improvement in a very short time. At the start of the year his 5k PR, run on the track, was 15:04. At Clubs, he went through 5k on a fairly challenging xc course in 14:56, and kept right on rolling. The Navy Mile was one of the few races all year where Stewart did not run a PR, but he showed his potential for greatness when he went toe-to-toe with a national-class field, beat several four-minute milers, and finished 2 seconds behind a 2016 US Olympian. Stewart is just beginning to scratch the surface of his talent, and his future is bright indeed. After graduating from Northwestern in the spring as an Academic All-American, Elena had an outstanding fall season for GRC. Elena made an auspicious GRC debut, winning the Pacers Clarendon Day 10k in 36:16. Elena capped off her the road portion of her season with a strong half marathon debut in Philadelphia, where she ran 1:21:14 on an unexpectedly difficult course. Elena truly shined in cross country, placing 3rd in the USATF East Regional, and capping off her season with an excellent 76th place finish at Clubs, which ties her for 9th on the GRC all-time list. Elena will be focused on the track this spring, and we’re sure to see a series of huge PRs from her. 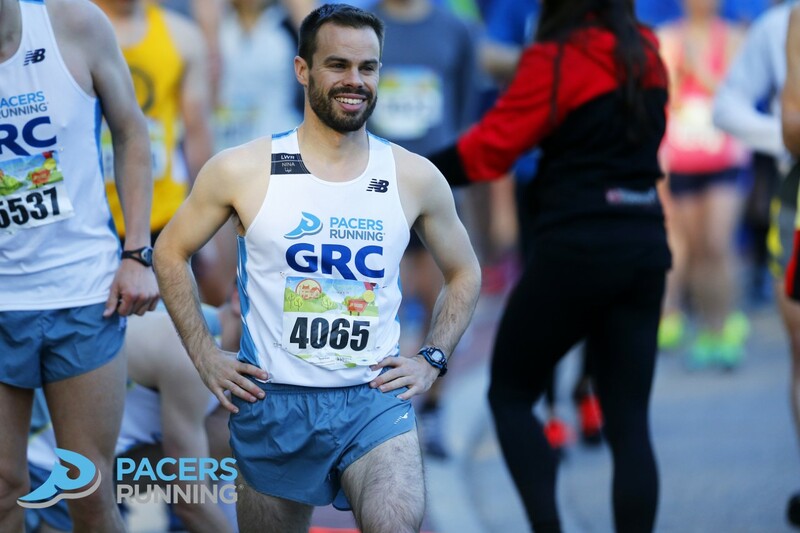 David was an excellent cross country runner in college (as a senior at Luther College in 2008, he was 8th at D-III nationals), and in recent years his focus shifted to the marathon (in 2014 he ran a PR of 2:27:28), trail running, and ultras. While David has not totally shaken the trail/ultra bug, as demonstrated by his crushing the course record at the Patapsco Valley 50k in October, he made a highly successful return to cross country this fall. After getting his xc legs back under him at two early season meets, David had a major breakthrough at the USATF East Regional, placing 4th. Even though the course in Tallahassee was far too flat for his liking, David finished an outstanding 100th place at Clubs. With David’s excellent range and renewed affinity for shorter races, we’ll be seeing many great performances from him in the future. Ever since Nina’s tragic death, Mary Grace has been singularly focused on honoring Nina’s memory, and she had gone to extraordinary lengths to make it possible to continue Nina’s mission of empowering women athletes in the Middle East. Among Mary Grace’s many endeavors to further that incredibly noble objective are establishing the Nina Brekelmans Memorial Foundation, serving as Race Director for the Nina Brekelmans Memorial Scholarship 5k, and travelling to Jordan to participate in the Nina Brekelmans Running Camp and Race for Girls. 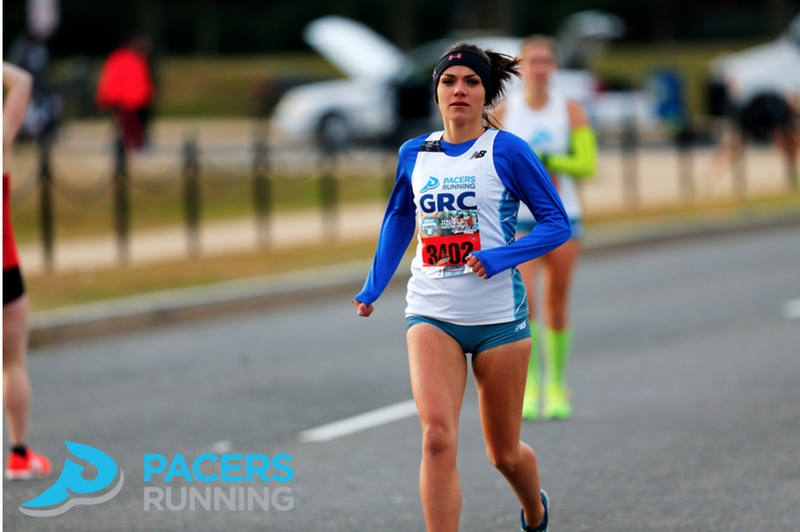 While doing all of that to honor Nina, on top of working a demanding job, Mary Grace managed to find time in 2016 to train for her first marathon, and coming off a serious knee injury that greatly hampered her fitness, she ran an impressive 3:20 in her debut. 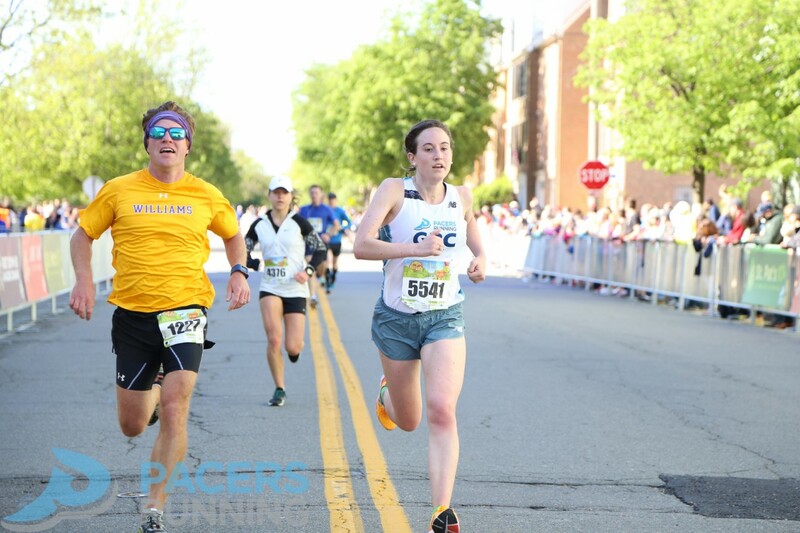 Mary Grace will look to improve on her marathon PR when she runs Boston this spring, and she hopes to ramp up her training when she heads off to business school at Michigan in the fall. 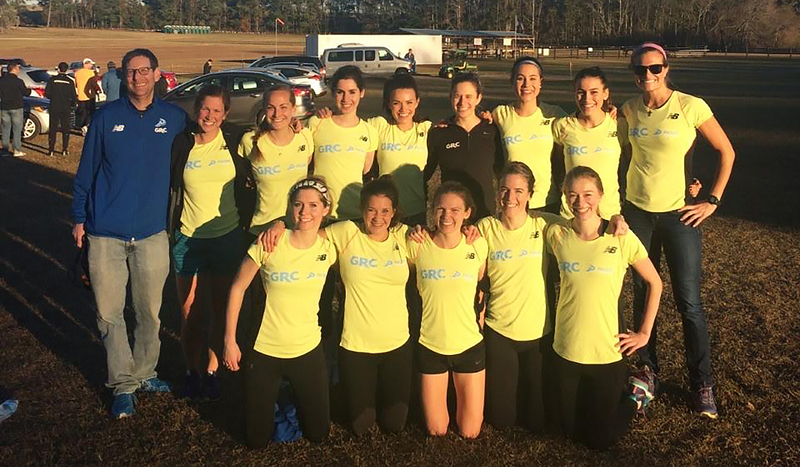 Mary Grace’s dedication to Nina, her dear friend and teammate, has been truly exemplary, and she has been an inspiration to all of GRC. Sam has made an extraordinary impact during his GRC career, both as an athlete and as a team leader. 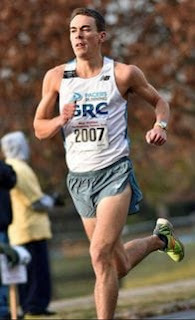 Sam was the men’s MVP in 2011, when he ran club records on the track in the 5000 (14:15) and 10,000 (30:13), and in 2012, when he shattered his own club record in the 10,000 by running the outstanding time of 29:37. Despite taking a nasty spill mid-race, Sam was the 5th man on our team that placed 9th at Clubs XC in 2013, which was a major breakthrough for our program. Sam persisted through a series of injury-plagued seasons, and made an excellent marathon debut in 2016, running 2:28:03 in very challenging conditions at Grandmas, establishing himself as a legitimate contender for the 2020 Olympic Trials. In addition to his prowess on the track and the roads, as a long-serving GRC board member and three-term team president, Sam has been directly involved in the phenomenal success of the team. Among his many administrative accomplishments, Sam assisted with the incorporation of the team as a non-profit, and was an integral part of the negotiations with Pacers that resulted in our affiliation with our generous sponsor. While Sam is headed to San Francisco to seek fame and fortune, his influence on the team will endure long after his departure.